Mark A. Roeder's comments on the building o the Aubbeennaubbee here. 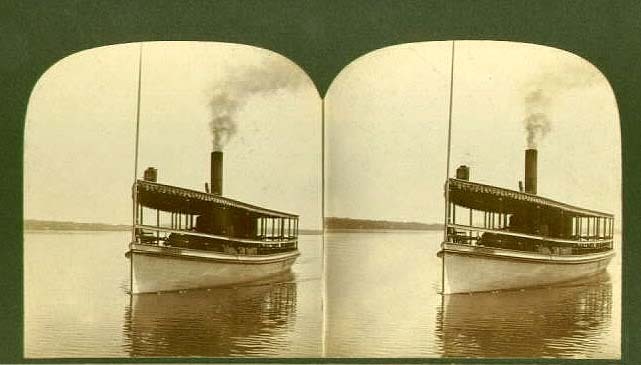 Three different views of the Aubbeenaubbe steamboat, one of the most famous and beloved steamers on the lake during the late 19th and early 20th century, and built by Capt. Jacob Larsen. Eventually a second deck was added to the boat, as evidenced in the last photo. Thanks to the Culver Antiquarian and Historical Society for the use of the photos. 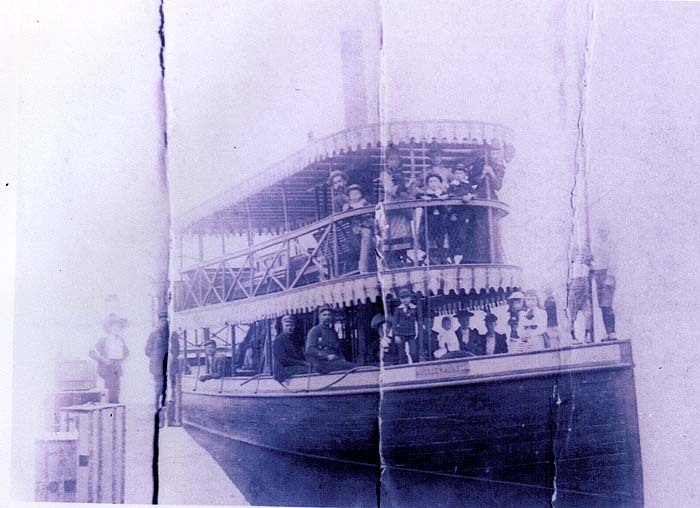 A large photo from John Cleveland's collection, this image is of the steamboat, The Aubbeenaubbee, loaded with passengers on both decks; the boat was one of the more famous and popular to sail the Lake, and sailed during the late 1800s, ending in 1903. 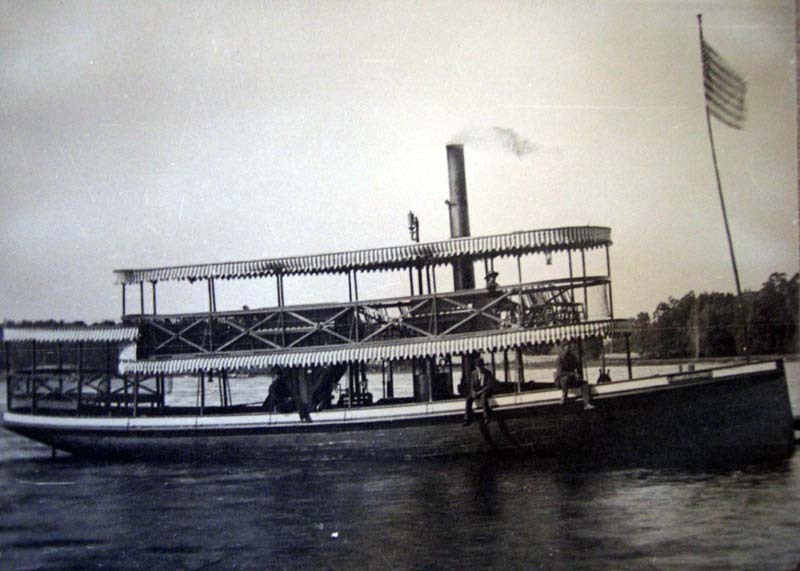 Another view, from a photo in the Cleveland collection, of the steamboat, The Aubbeenaubbe. 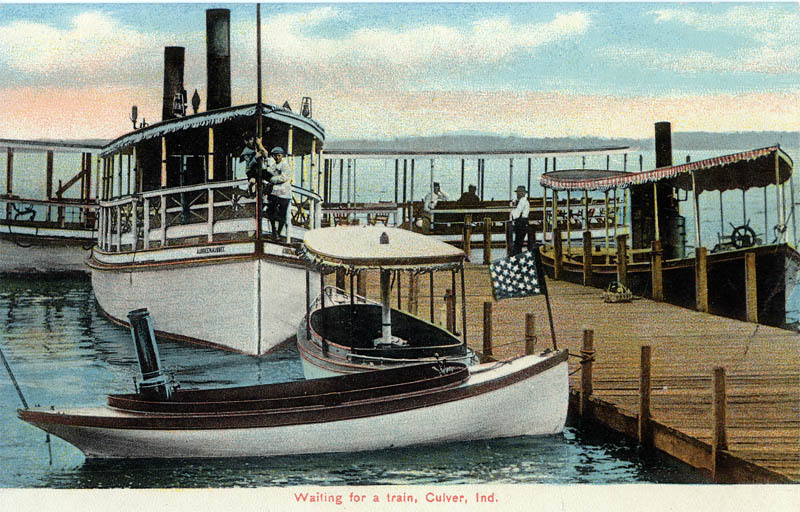 This postcard reads, "Waiting for a Train, Culver, Indiana," and depicts a waiting area just down the hill from the Depot and the steamboat the "Aubbeenaubbee." 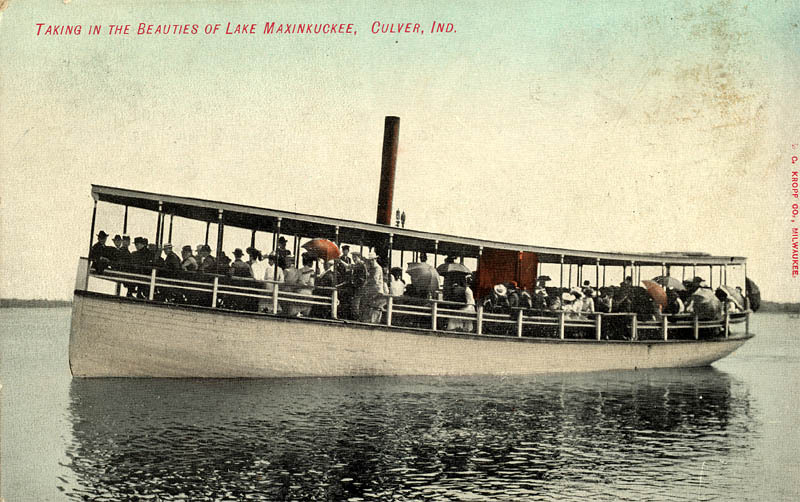 A "Scene on the Lake," an undated postcard showing one of the large steamboats that carried passengers around the lake. The Peerless was said to have been built by the well-known Capt. Ed Morris. Click here (or see below) for information on Morris and his boat-building. 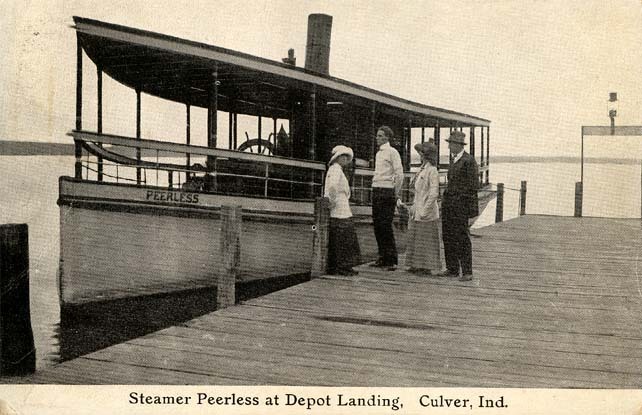 "Steamer Peerless at Depot Landing," says this undated postard. More on the "Peerless". The Steamer Peerless, early 20th century. 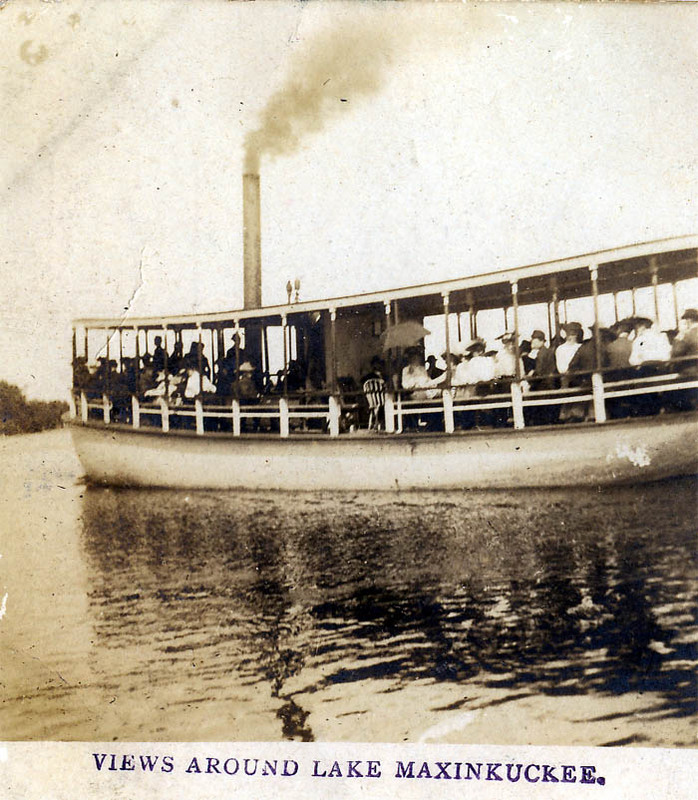 The Steamer, The "Lloyd McSheehy"
The Steamer, "Lloyd McSheehy" on the lake, an 1898 photo. Mark A. Roeder's comments on the history of the Lloyd McSheehy here. 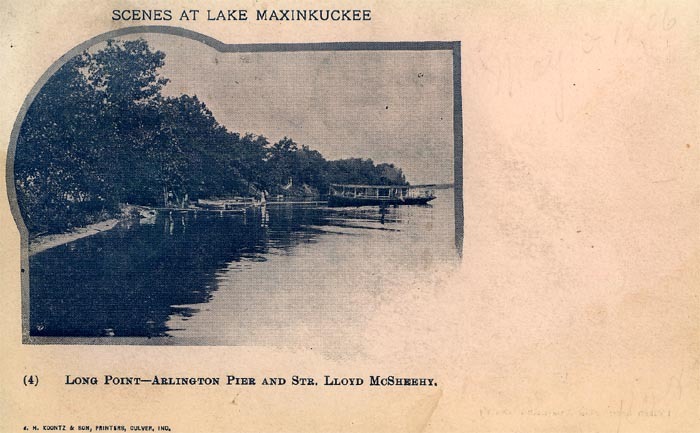 "Scenes at Lake Maxinkuckee," a 1906 postcard which depicts "Arlington Pier and Str. Lloyd McSheey" at Long Point. 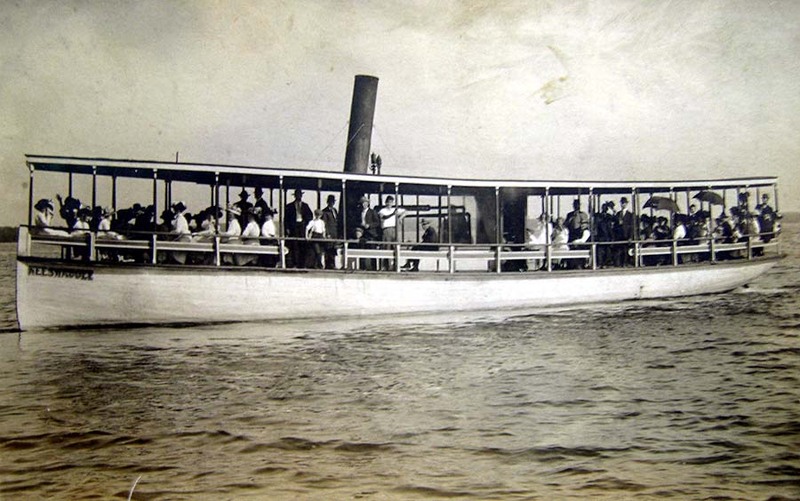 Rare photo of the "Neswaugee" steamboat during the Smith-Hittle reunion, circa 1910. 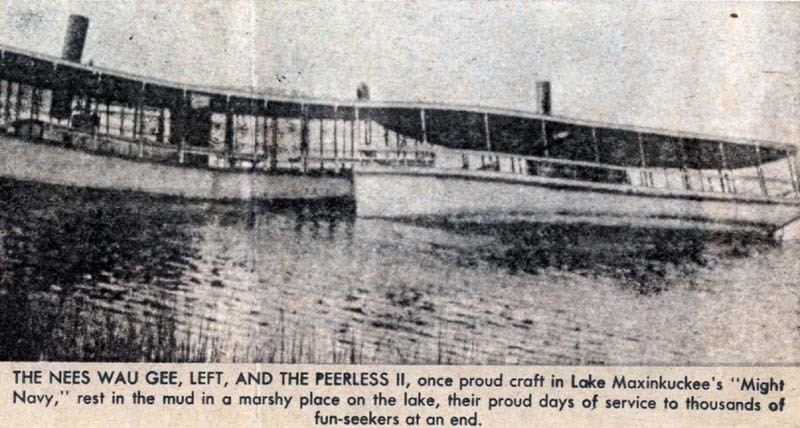 "The Neeswaugee, left, and the Peerless II, once proud craft in Lake Maxinkuckee's "Might Navy," rest in the mud in a marshy place on the lake, their proud days of service to thousands of fun-seekers at an end." 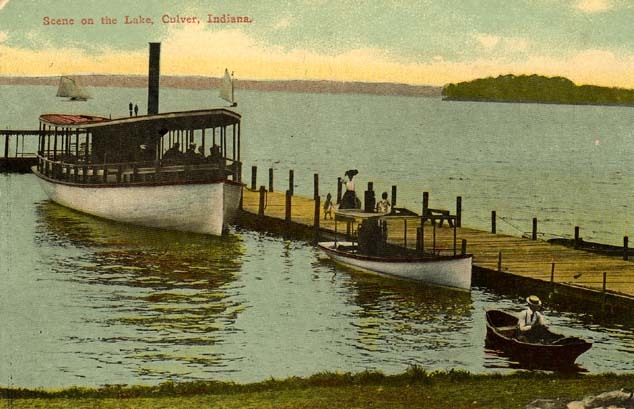 "Pleasure Riding," says this early postcard depicting two of the steamboats that sailed the Lake, here docked at the Vandalia pier in Vandalia Park. To the left is the "Neeswaugee," named after the Indian Chief of the same name, and built by a Bass Lake man named Peterson in 1903. 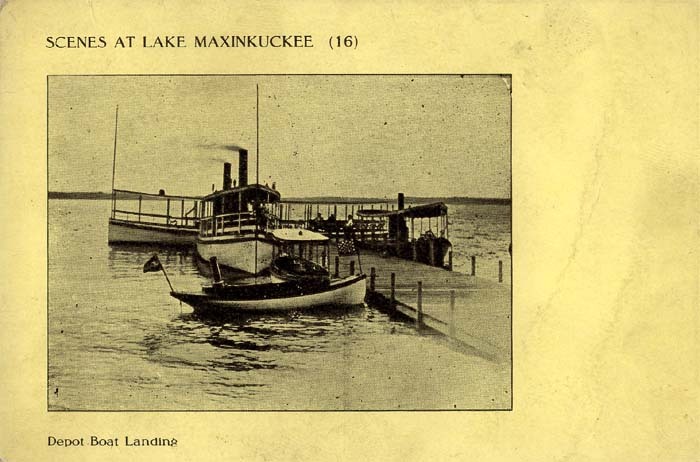 This was the last major steamboat to operate on Lake Maxinkuckee. 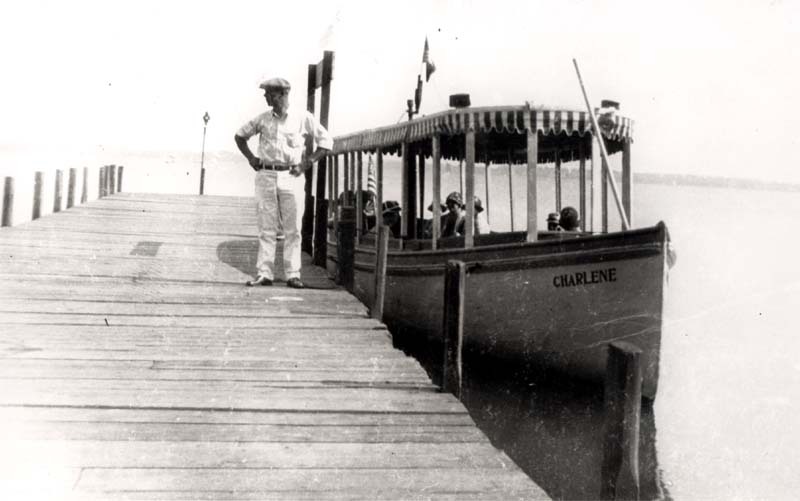 A lesser-known steamboat on the Lake, the Charlene, in an undated photo. 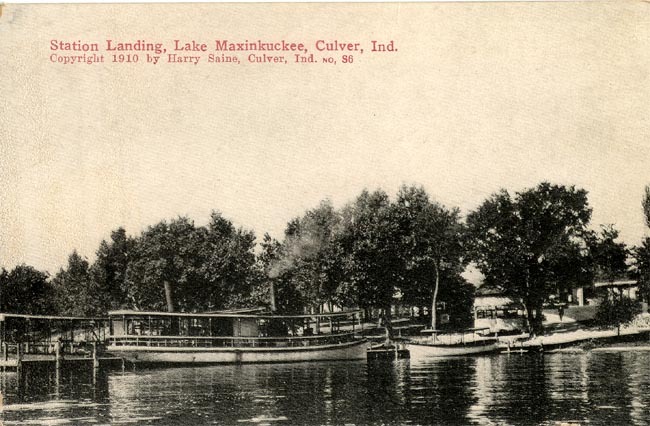 Mark A. Roeder's extensive chapter on the various vessels of Lake Maxinkuckee here. 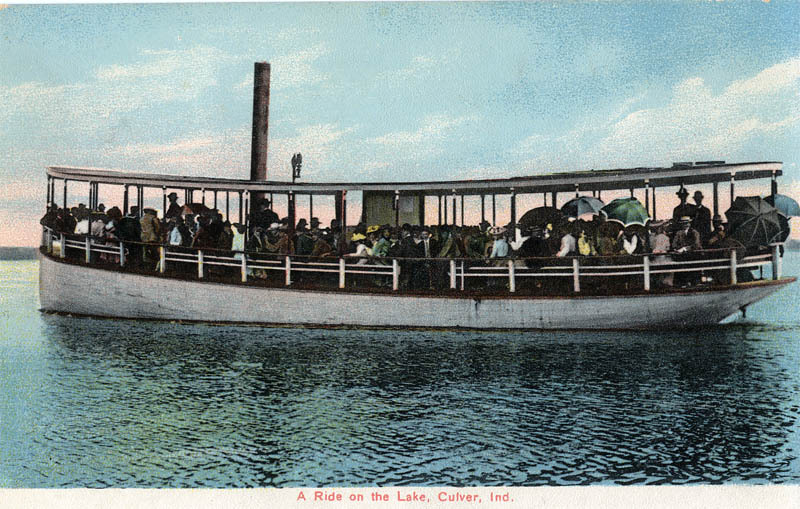 "A Ride on the Lake," another early postcard, this one depicting one of the many steamboats that sailed the Lake. 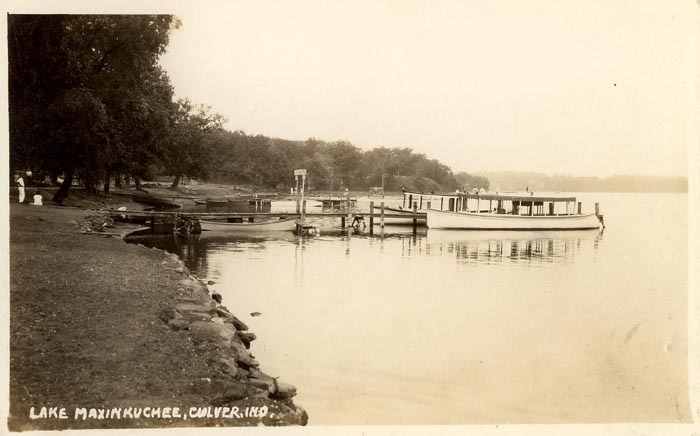 "Views Around Culver Indiana" postcard, 1907. 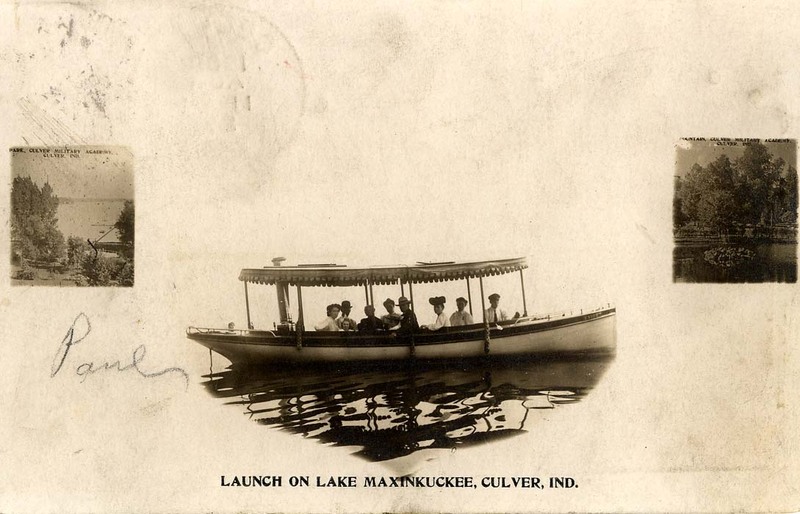 "Taking in the Beauties of Lake Maxinkuckee" postcard, 1908. 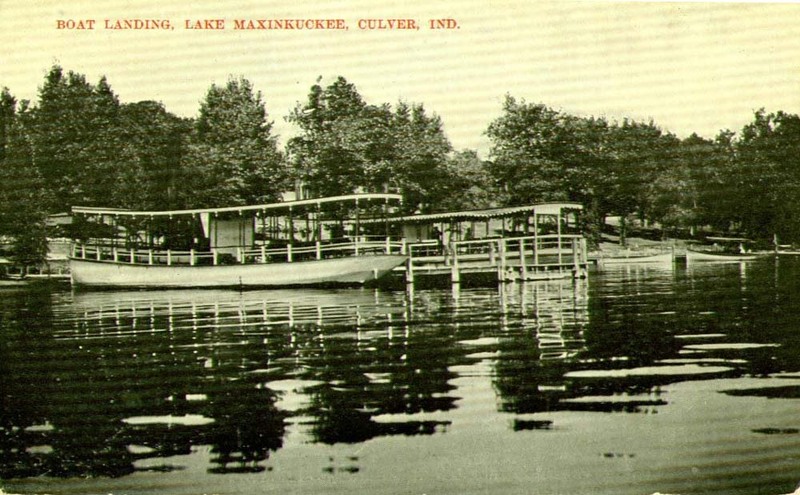 "Sightseeing at Lake Maxinkuckee," a 1912 postcard that serves as a black and white version of "Steamboat Landing." 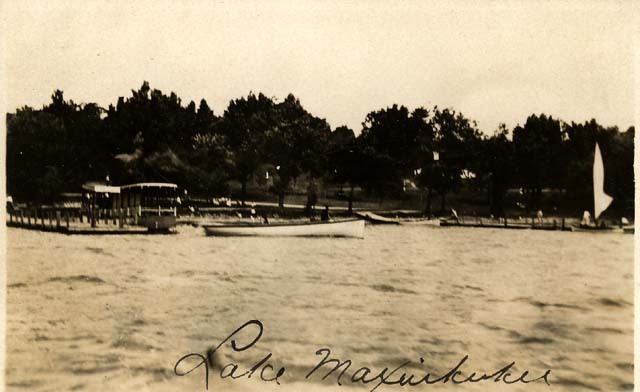 A beautifully photographed "Scene on Lake Maxinkuckee," dated 1912, depicts the Vandalia Park area and shows the Round Stand at left, the steamboat pier at right. 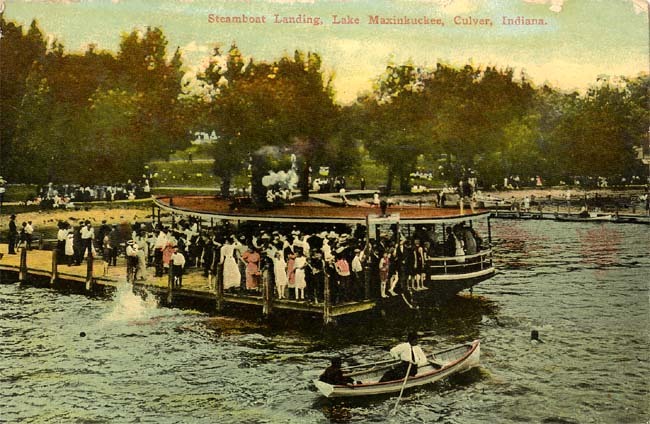 "Steamboat Landing at Lake Maxinkuckee," reads the caption on this 1912 postcard. 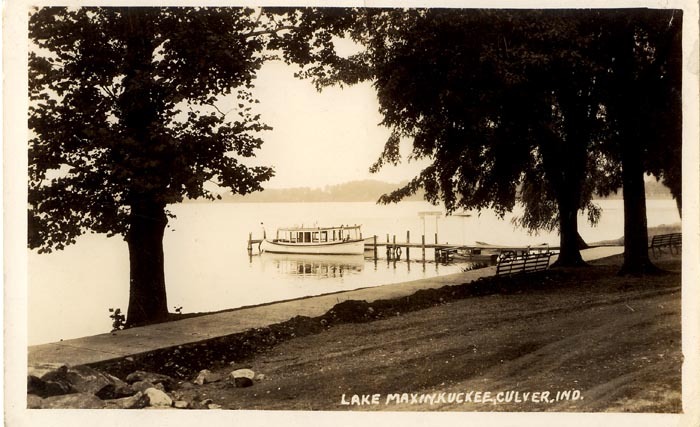 The image is a colorization of "Sightseeing at Lake Max." 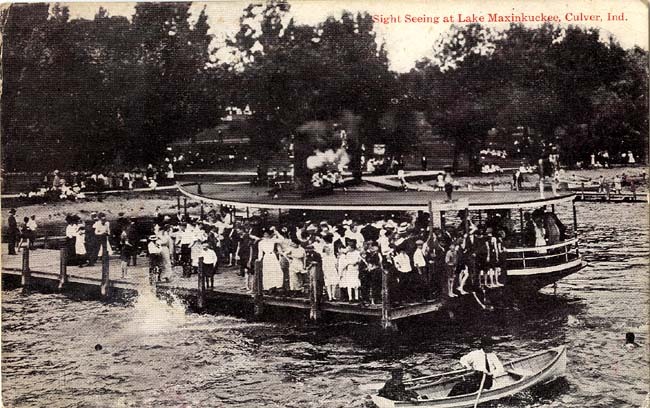 An undated postcard captioned, "Boat Landing, Lake Maxinkuckee," showing the boat landing in Vandalia Park. 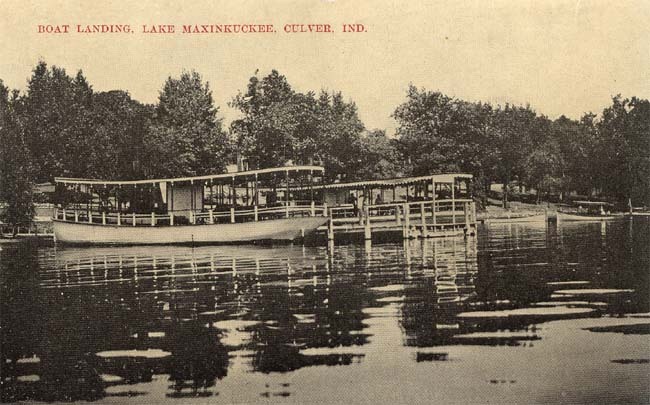 "Launch on Lake Maxinkuckee," a 1908 postcard showing one of the many steamboats trolling on the Lake. 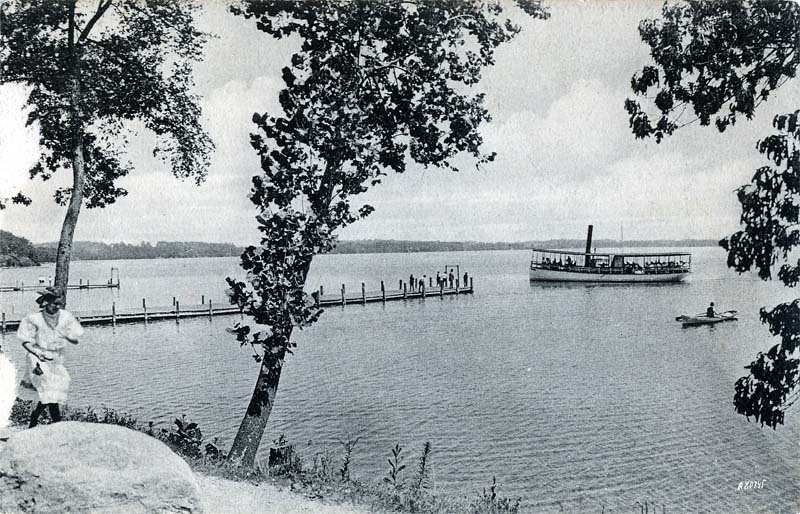 A 1906 postcard captioned "Depot Boat Landing." A 1905 image from the Maxinkuckee Art Annual lent to the library by Marcia Adams, this one captioned, "Launch Starting on a Voyage." 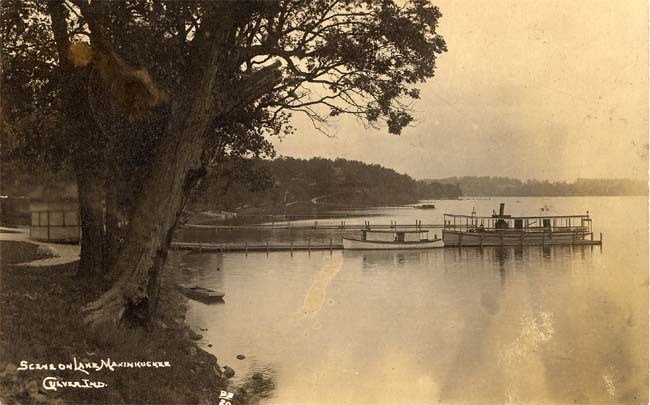 Rare photo of the steamboat pier at Vandalia Park in the early 20th century. 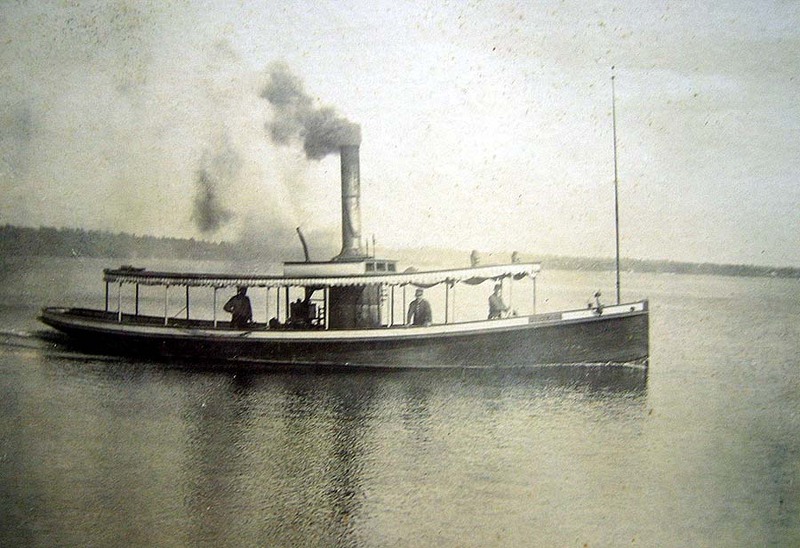 Can anyone identify which steamboat this is, depicted in the early 20th century? Undated postcard shots of assorted steamboats docked at the depot pier in Vandalia Park. 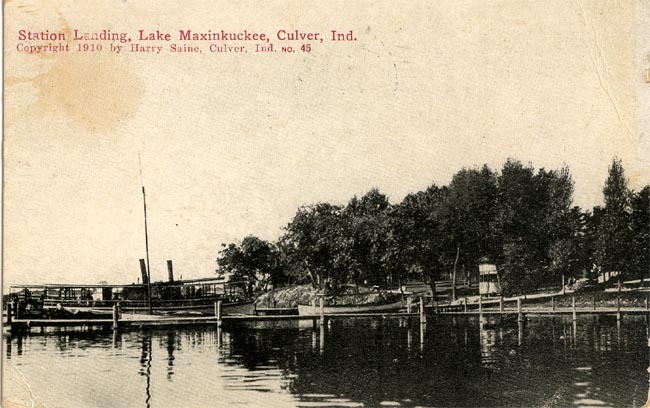 The scene in this undated postcard marked only, "Lake Maxinkuckee" depicts the steamboat pier and shore in the Vandalia Park area. 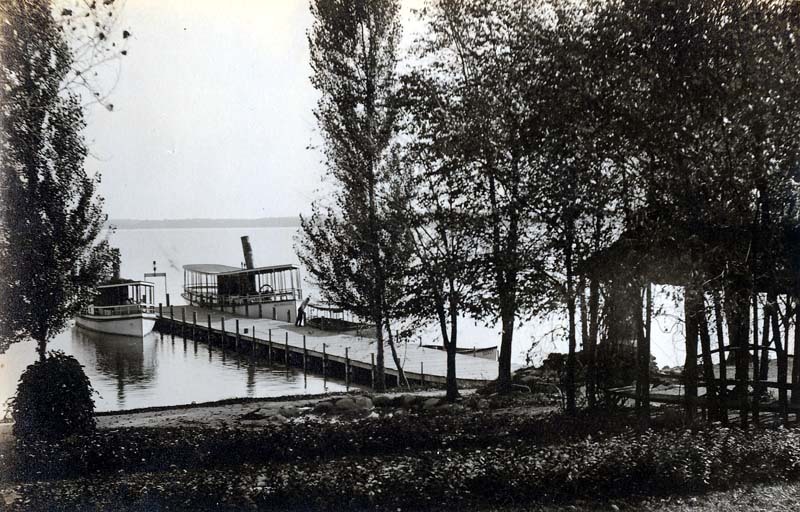 The steamboat pier at Lake Maxinkuckee (in what would become the town park, but at the time was Vandalia Park), where the fishing pier sits today. 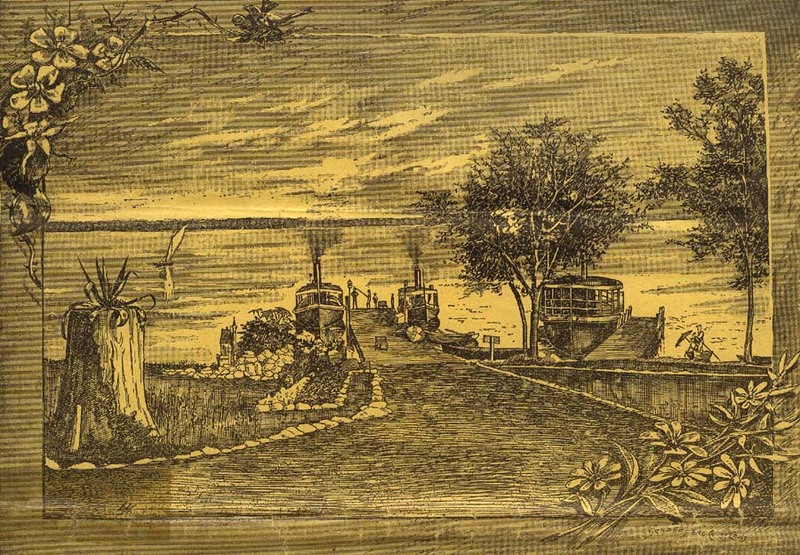 This engraving comes from the 1889 Lake Maxinkuckee Assembly bulletin (click to view more). Another early postcard from Verl Schaffer's collection, the steamboat landing pier can be seen clearly here, from the bluff in Vandalia Park, still part of Culver's Town Park today. An early and unusual postcard from Verl Schaffer's collection, depicting Vandalia Park and the steamboat landing pier (site of today's VFW pier). It is unclear whether the wooden structure in the right portion of the picture is related to the round stand which sat for years in the park, or whether it is a different structure entirely. 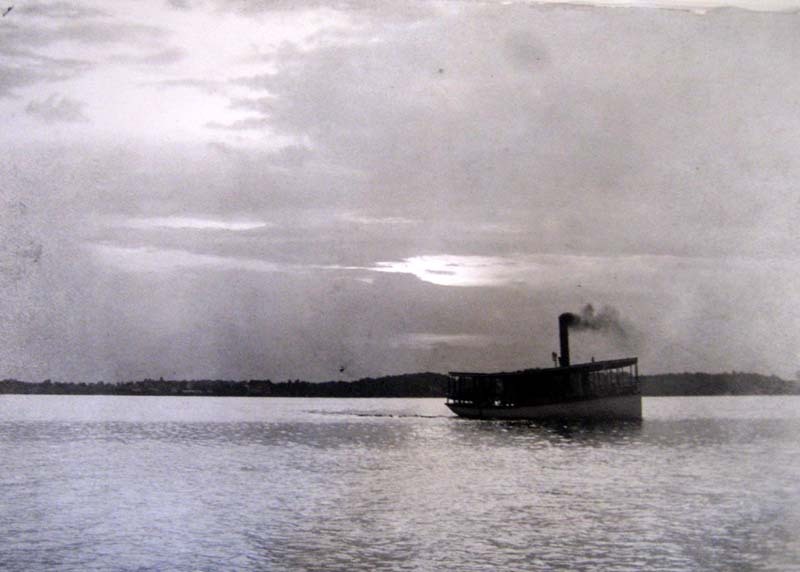 An unknown steamer on the lake, early twentieth century (image courtesy the Marshall County Historical Museum). 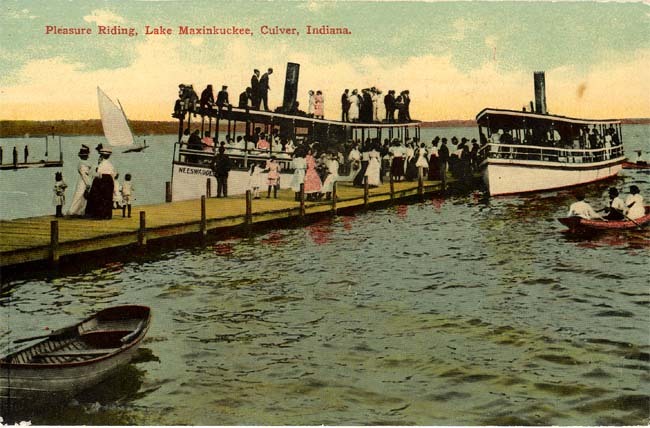 A postcard from circa 1910 showing the "Station Landing" (a reference to the train station, or Vandalia Park depot) on the Lake. Another wide postcard captioned "The Lake" from 1909. 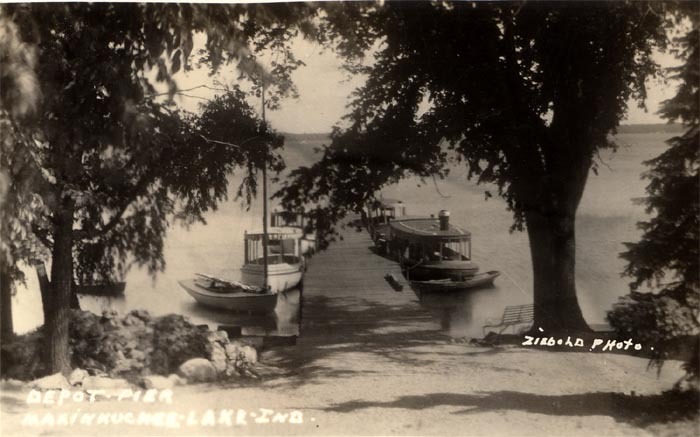 This image gives a wonderful picture of the lake culture of the turn of the century. Does this photo show the upper, or west pavilion area of Vandalia park in this period? If so, at left is the main steamboat pier (or "station landing") for pickup of passengers from trains, with two other piers at right depicting a number of steamboats at work. 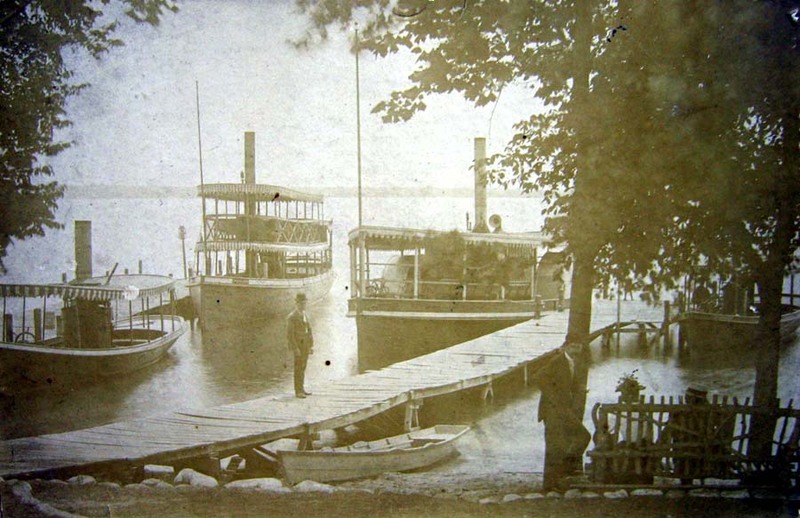 Or, are we looking at a photo taken from the bluff in today's "Indian Trails," showning the steamboat pier at the Lake View hotel, in which case the pier at RIGHT is the Vandalia park steamboat pier? Note the Victorian period dress of the day, in spite of the assuredly hot weather! 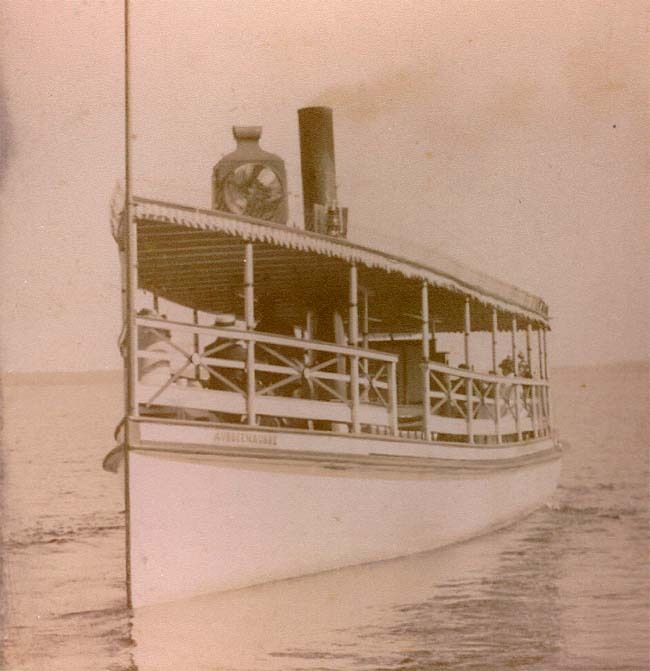 An unidentified steamboat from the early 20th century. 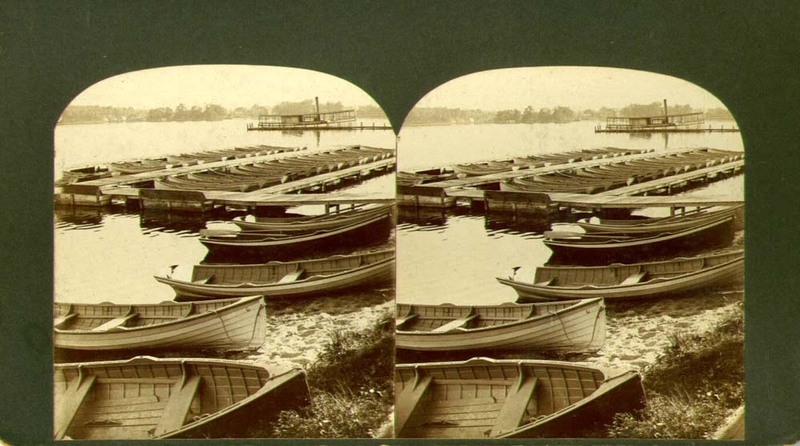 A stereoscopic image of the Morris Boat Livery, with a steamboat in the background. 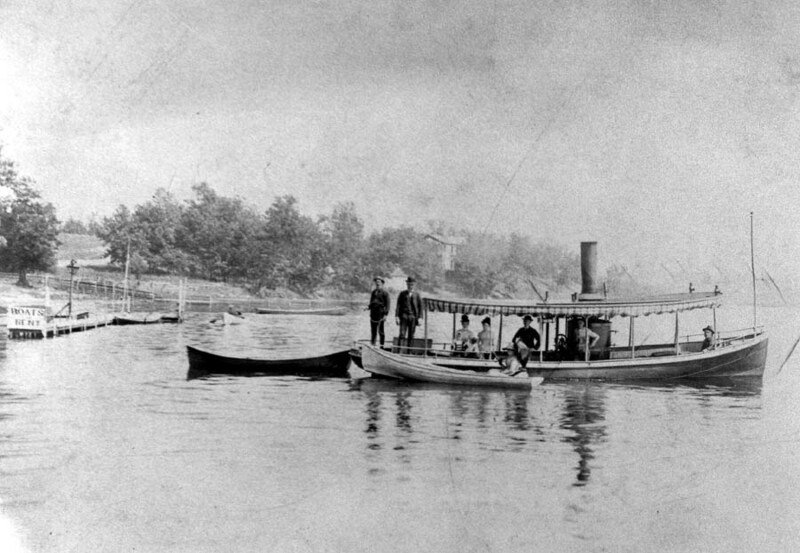 A picture of steamboats near Vandalia Park. 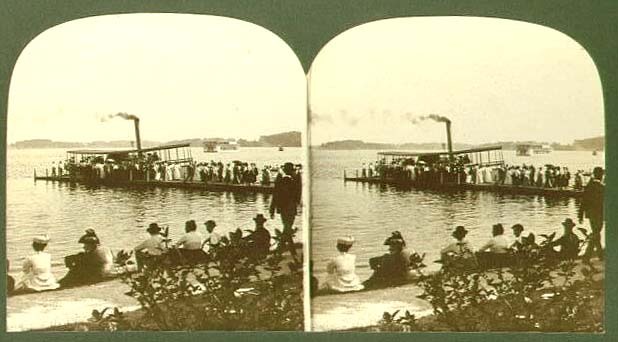 A "stereoscope" postcard depicting the steamboat pier with a launch taking on passengers, in Vandalia park at Culver near the turn of the 20th century. The steamboat SS Arlington docked alongside the iconic Arlington Hotel on the south shore of Lake Maxinkuckee's Long Point on the lake's west shore. This fascinating view not only depicts an unusual angle on the hotel itself, but also appears to show the small Arlington depot, an elusive piece of "lost" history of Culver. The Arlington depot would have been the only depot in the Culver area besides the main Vandalia depot located in the town park. Fascinating and rare photo from the pre-1920s, taken alongside the shore where today's town park is in Culver. 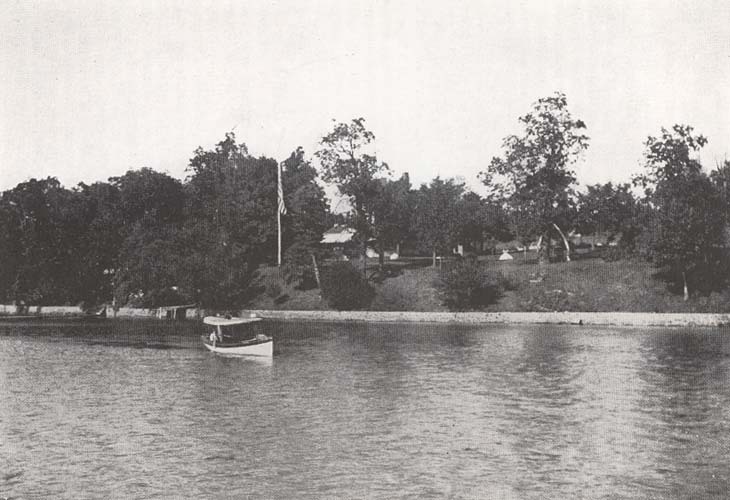 The sign at left says "Boats for Rent" and almost certainly depicts Captain Morris' boat house pier on the east end of Vandalia Park, close to where the Beach Lodge rests today. In the background on the ridge can be seen the Lake View Hotel, at the site of today's Indian Trails woods between the town park and Culver Academy. Article: 15 Sunken 19th Century Steamboats found in Lake Maxinkuckee - Part of Shipwrecks of Indiana, from the Ind. DNR. 1852 – “Queen of the Lake” . . . Large Flat Bottomed Skiff, built by Isaac A. Morris. 1874 – “The Anna” . . . . Large Sailboat, built by W. W. Hill. 1876 – “The Nancy Lee” . . . Built by Capt. Ed Morris. 1880 – “The Elephant” . . . 18X20’ Sailing Craft, in cooperation building venture, built by Lake View Club membership. - “The Bessie” . . .
1895 – “The Peerless II” . 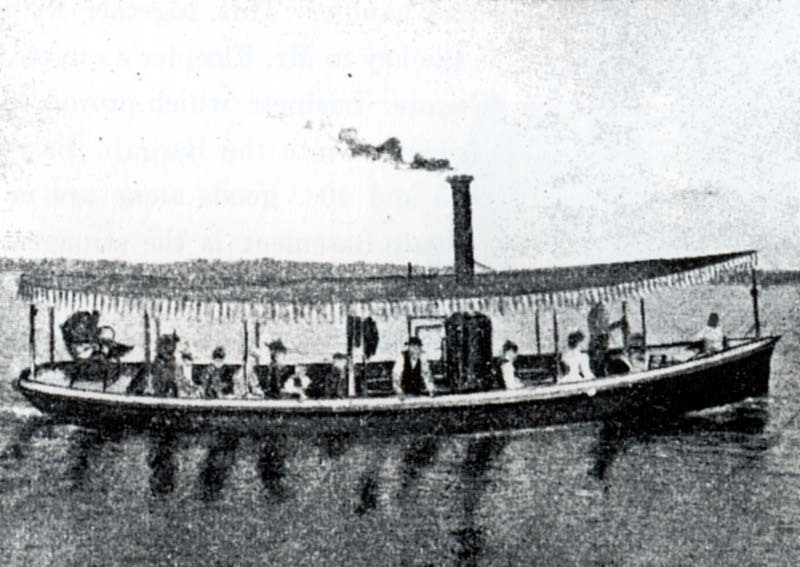 . . Steamboat built by Capt. Ed Morris . . . Sold to M. K. Lord, 1897. Remained in operation till 1915. - “The Neeswaugee” . . . 14X70’ 2-deck Steamboat, Capacity: 200 passengers, built by Capt. Crook. Remained in service till 1915. (?) - “The Daisy” . . . Steamboat. 1883 – “ The W. R McKeen” . 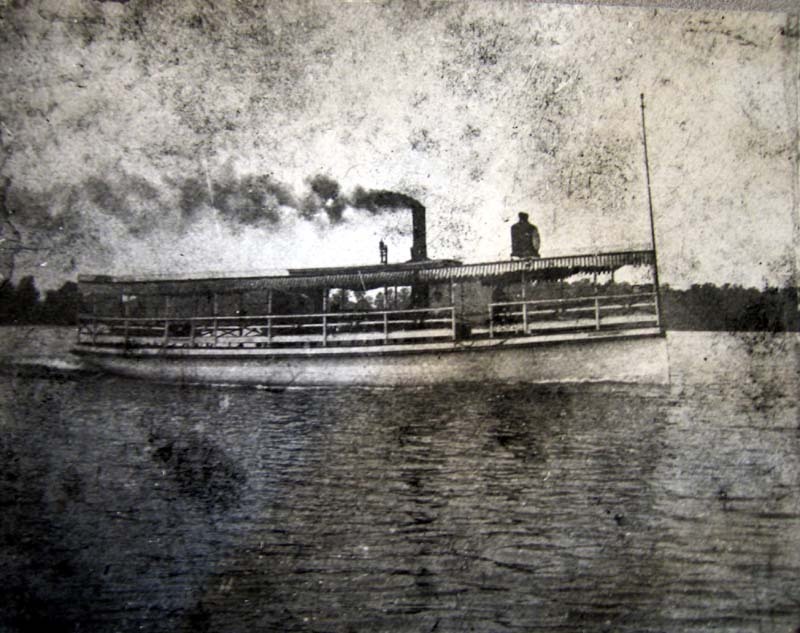 . . Ironclad Steamer. 1905 – “The White Swan” . . . 30X70’ 2-deck excursion ship, builder, Capt. Crook . . . Remained in service till 1907. … Prominent tourist floating dance pavilion. 1938 – “The Red Wing” Formerly on Lake Manitou, the 65-passenger, diesel powered excursion ship purchased, 1938 by Art Simpson. Renamed “The Maxinkuckee”. Later owned by Erv Thessin, Frank Amond, Phil Scruggs, Sold late ‘70’s for use, Lake Wawassee. 1958 – “CSNS Yarnell” . . . 60X131/2’ diesel powered, destroyer type ship. Built CMA Boat Shop by W. C. Craft. Named for Adm. Harry Yarnell, CNS Director.